The Big Issues Bedeviling Harry Reid To get the necessary 60 votes to pass health overhaul legislation, Senate Majority Leader Harry Reid must resolve Democrats' disagreements on the public option, abortion, cost and affordability. No one knows how long the Senate health care debate will last. But at least one thing is clear: until Majority Leader Harry Reid gets consensus on two volatile issues – whether to include a government-run "public option" health insurance plan and abortion coverage – it's unlikely that the Nevada Democrat will able to get 60 votes for a health care deal. Meanwhile, as Senate floor action enters its second week, the chamber is likely to debate amendments, including one on whether to permit the importation of drugs from other countries, where they often sell for less than in the United States. And Sen. Judd Gregg, R-N.H., is expected to propose an amendment that would require all money from the Medicare payment changes in the bill be directed back to the Medicare program instead of being used to help fund the legislation. Reid continues work on a package tailored to meet the demands of his caucus. Some want more cost-containment measures in the bill, while others want more generous subsidies to help people afford coverage. Members may also be looking for a special deal to help their state in exchange for their support. Reid could file his "manager's amendment" outlining changes as early as this week. President Obama's speech Sunday afternoon to Democrats offered few specifics on what the president wants to see in the bill but rather was a reminder of the historical significance of passing health care legislation and a push to get lawmakers to finish the job. "He did a great job reminding us why we all run for elections," said Sen. Claire McCaskill, D-Mo. "We run for office to try to make a difference, not to be the most beloved person on the planet. I think here in Washington we get those confused sometimes." * Public Option: While the Congressional Budget Office (CBO), the official scorekeeper of Congress, predicts that just three million to four million people will enroll in a government-run public option, the issue has consumed much of the debate due to the strong feelings around it. Proponents of a public option say it's needed to give insurers competition and consumers more choice. Opponents say it's an unnecessary expansion of the federal government into the health insurance sector. 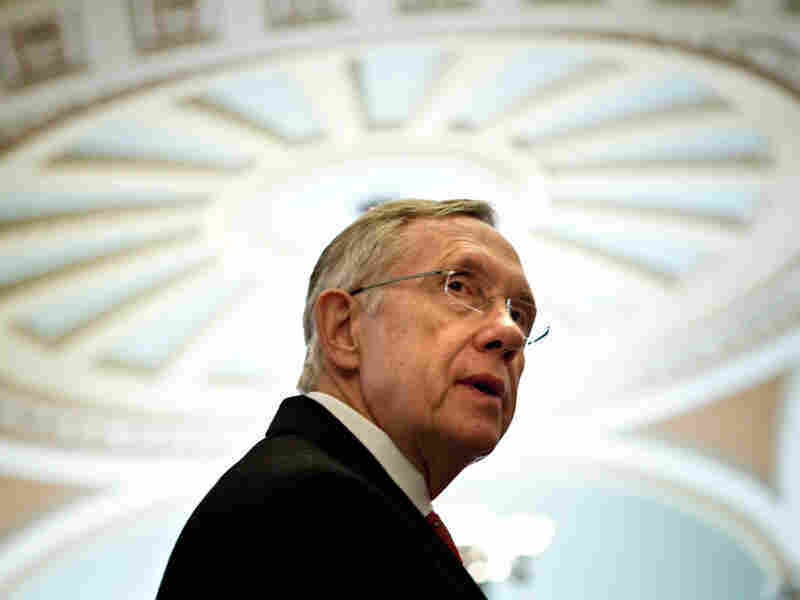 As currently drafted, Reid's bill would allow states to opt-out of the public plan. Sen. Olympia J. Snowe, R-Maine, has met with Democratic moderates on the issue in an ongoing discussion. Snowe has favored a "trigger" option by which the public plan would be available only if 95 percent of a state's residents did not have access to an affordable health insurance plan. President Obama and Reid have been seeking Snowe's support for the Democrats' health care plan. Reid said Sunday that a group of 10 senators representing the moderate and liberal factions of his party have made "a lot of progress" in developing an alternative to the government-run public health insurance option in his bill. The group continued their talks throughout the weekend. One idea under discussion would create a set of national health insurance options similar to those offered to federal employees and overseen by the Office of Personnel Management. * Abortion: Sen. Ben Nelson, D-Neb., a moderate whose vote Reid is courting, is expected to offer an amendment as early as today to adopt House-passed abortion language in the Senate bill. The House measure, co-sponsored by Rep. Bart Stupak, D-Mich., would forbid insurance plans offered in a health insurance "exchange" from covering abortion services and abortion would also not be allowed in the public plan. While the Stupak language is not expected to get 60 votes in the Senate – the threshold all amendments must meet for passage – Nelson has said he won't vote for the bill unless it contains abortion language similar to the House bill. Nelson's support is critical because no Republicans have yet said they support the Democrats' health plan. * Cost-containment: Some members of Reid's caucus want the bill to do more to control health care costs. On Friday, Sens. Arlen Specter, D-Pa., Joe Lieberman, I-Conn., and Susan Collins, R-Maine, proposed several changes to the bill they said would help control costs, including moving up by one year the start date for a payment "bundling" program that would encourage medical providers to better coordinate care and increasing from 1 to 2 percent the penalty the bill would assess on hospitals that have high infection rates. * Affordability: Snowe has asked the CBO to provide more information on how the legislation would affect average premium costs and small businesses, as well as analyze premium effects by state. "The issue of affordability must be a cornerstone of a health reform bill and remains one of my paramount concerns, Snowe wrote in her Dec. 3 letter to CBO. Some Democrats have also expressed concern that the subsidies in the bill may not be generous enough to help people afford coverage, especially if they are forced to pay a penalty for not having health insurance. KHN's Phil Galewitz contributed to this report.